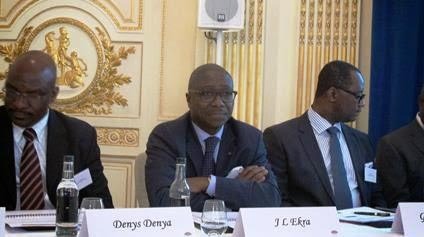 Afreximbank President Jean-Louis Ekra, flanked by Denys Denya, Executive Vice President, Finance, Administration and Banking Services, and Dr. George Elombi, Executive Vice President, Corporate Governance and Legal Services/Executive Secretary, during the update meeting with the Banks relationship banks in London. The African Export-Import Bank (Afreximbank) attracted some $8 billion into Africa in 2014 through the 19 syndicated financing deals which it either arranged or co-arranged, Jean-Louis Ekra, President of the Bank, has announced. The President, speaking in London recently during Afreximbank’s annual update meeting with its relationship banks, said that a key part of the bank’s strategy was to use traditional instruments in leveraging international financing into Africa, including through arranging or co-arranging syndications and club deals and inviting other financial institutions to share risk. He stated that for every dollar that the bank committed in syndications during the year, it attracted $7 into Africa in a perfect example of leveraging external financing to support its lending activities. Ekra said that Afreximbank’s targets for 2015 included growing its net income by about 26 per cent to $132.4 million; growing its assets by about 15 per cent to $6.3 billion; keeping the cost/income ratio from exceeding 30 per cent; maintaining Tier 1 capital ratio within the 20 per cent to 30 per cent range; and operationalizing its Abidjan and Nairobi branches. He told the audience that financial institutions supporting Afreximbank would find in it a strong and credible partner in Africa with very good knowledge of the market; a bank with a proven track record of repaying loans; ancillary business in the areas of forex buying and hedging, money market deposits, correspondent relationships, co-arrangement of syndicated facilities in Africa, partnering in implementing advisory services, etc. ; and support in lending into Africa through reimbursement guarantee facilities, country risk guarantee facilities, African payment services and trade information, among others. The update meeting with the relationship banks, also known as “the Investors’ Lunch”, allowed Afreximbank to present updates on its 2014 financial results and on its capital increase exercise. The events commenced in Abu Dhabi and Dubai, 5 May 5, with a meeting with investors, and were followed by an investor’s conference call on 8 May. Accompanying the President were Denys Denya, Executive Vice President, Finance, Administration and Banking Services; Dr. George Elombi, Executive Vice President, Corporate Governance and Legal Services/Executive Secretary; Dr. Philip Kamau, Senior Director, Finance; Dr. Hippolyte Fofack, Chief Economist; Chandi Mwenebungu, Head of Treasury; Simon Tiemtore, Head of Corporate Finance and Advisory Services; and Yomna Rashed of the Treasury Department.